How far would you travel to be a spectator at the FIFA World Cup? Perhaps this is the biggest test of football fervor. Florian Keller, Co-Founder of Enchanting Travels, is no stranger to long-distance adventure travel and enjoys an overland expedition: Nairobi to South Africa, to the largest international football competition. Four years ago, Florian embarked on an epic overland Kenya to South Africa tour for 10 weeks, starting from Nairobi to South Africa and shares his highlights with us. 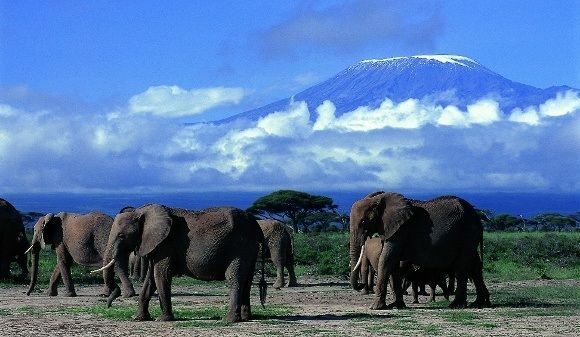 The Africa travel journey started in Nairobi on a clear morning in mid May and, with several Germany flags flying out of the Landcruiser’s windows, we cruised towards the Tanzanian border and enjoyed the beautiful views of Mt Kilimanjaro and Mt Meru. We stopped in the scenic Usambara Mountains in northern Tanzania, the dramatic Uluguru Mountains in central Tanzania, and at the beautiful Southern Highlands where we enjoyed horse riding through the green carpeted tea plantations and in the bustling town of Mbeya in South Western Tanzania. We drove to the northern end of Lake Malawi and spent a night in a quaint guesthouse on a secluded sandy beach in breathtaking surroundings, with mountains plunging right into the blue waters of Lake Malawi. Pristine beauty comes at a price: every meal was dry fish and rice! We crossed the border to Malawi, where we found the “warm heart of Africa”. When we told locals we were on our way to the soccer world cup they would often ask to join us on our trip to South Africa! Our journey along the stunning Lake Malawi was a pleasant one, with stops at Chintheche on the central lakeshore where we explored picturesque islands and crystal clear waters by boat, kayak and a traditional dhow. 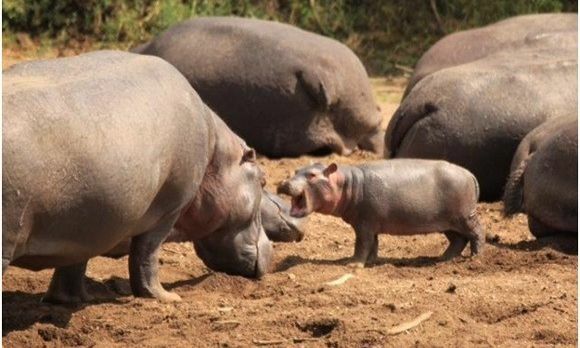 We then passed through Liwonde National Park, the premier game park in Malawi, where we experienced interesting game drives, bush walks and particularly enjoyed a boat safari on the Shire River, passing hippos, crocodiles, elephants and various species of antelopes at the edge of the river. Crossing the border to Zambezi, we went from enjoying a pleasantly warm afternoon sun on a Zambezi River boat cruise to excruciatingly cold evening temperatures due a strong current. 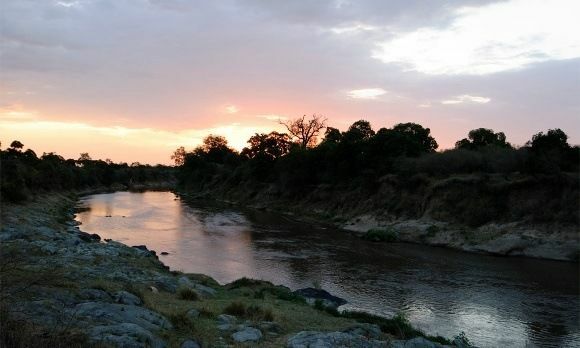 Quietly freezing, dressed only in T-shirts and shorts, we searched for the lights of our safari lodge with each bend in the river. Our dinner under the stars had to wait until after a hot shower. A canoe excursion the next morning as we silently glided along the riverbanks encountering hippos, elephants and buffalo at very close distances made up for the cold day before. 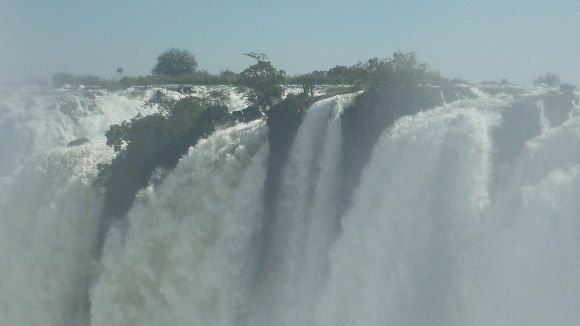 We then enjoyed a natural power shower at the mighty Victoria Falls, and fully appreciated this world wonder with a helicopter ride over the falls, enjoying fantastic views of the Zambezi River, the falls and the dramatically winding gorge below. We could not resist the temptation of a short detour to Botswana and to Chobe National Park where we stayed at the Zambezi Queen, a stylishly designed floating hotel on the Chobe River. Here, we experienced one of the highlights of our journey – a sunset boat cruise on the Chobe. Getting up close to kudu, giraffe, hippo and crocodiles and watching hundreds of elephants drinking, playing and cavorting at the water’s edge as the evening sun painted the scenery in a golden light made this one of my most memorable safari experiences ever. We spent two nights experiencing game drives and even more spectacular walking safaris in Hwange National Park, discovering that Zimbabwe has the best safari guides in Africa. But time was running out as we had to be in Durban for the first football match so we sped on, with only a quick overnight stop in the scenic Matopos National Park where giants appear to have piled up huge boulders into bizarre rock formations. 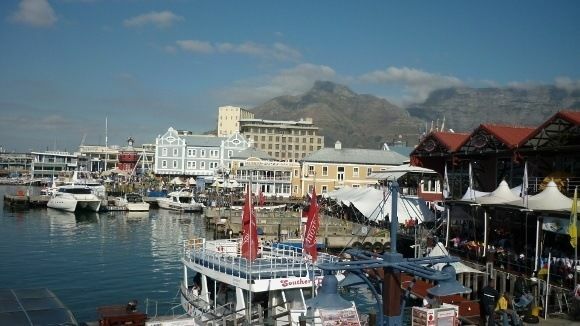 We reached South Africa on June 11, the day the Soccer World Cup started. All the South African immigration and customs officers were dressed in the shirts of Bafana Bafana, the South African soccer team, and in Messina, the South African border town. The sides of the road were lined with people, all equally dressed in Bafana Bafana outfits and competing in making the loudest possible noise with their Vuvuzelas. Durban greeted us with its magnificent sea front which had been turned into a party zone for soccer supporters from around the world and locals alike. The excitement about the World Cup finally having come to Africa was very touching and remembering these moments, arriving in South Africa on the day the Soccer World Cup kicked off, still creates a subtle shudder down my spine. Over the course of the next four weeks, I traveled two full circles through South Africa following the German team during the World Cup and experiencing the beautiful Garden Route, the stunning Blyde River Canyon, the vast and striking Karoo and its smaller sister, the Little Karoo, bustling Cape Town, the endless deserted beaches in Kwa Zulu Natal and the spectacular mountains of Lesotho. 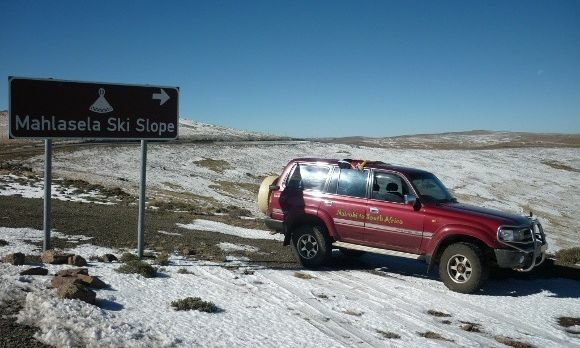 Here, I went on a beautiful pony trek in serene mountain country and couldn’t resist the temptation to ski at “Afriski”, the only ski resort in Southern Africa that has snow-making facilities. We then started our long 6,000 kilometer journey back to Kenya, largely along the Indian Ocean coast. 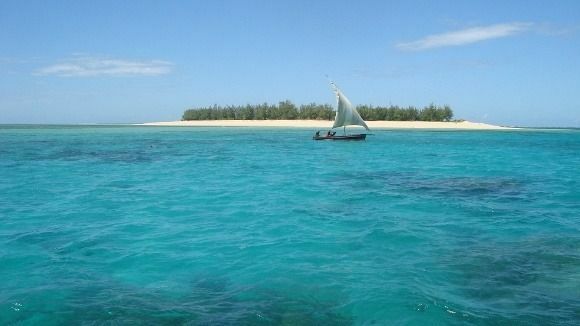 The most intriguing places on this journey were the strikingly beautiful Bazaruto Archipelago in Southern Mozambique, the not yet rediscovered Gorongosa National Park in Central Mozambique. In Ilha de Mozambique we felt like embarking on a journey back in time through the history of Eastern Africa and Arabia, to the fantastic and undiscovered beaches and reefs at Memba Bay, the only place on the East African Coast where snorkeling and diving is possible right from the beach, and the tiny islands surrounded by pristine coral reefs and turquoise water in the remote Quirimbas Archipelago in northern Mozambique. One of our most memorable moments on the entire journey was the Friday night disco on quaint Ibo Island in the Quirimbas – dancing with the locals under the stars and next to a mango tree right next to the beach was almost surreal. There were times on our journey when we were in absolute No Man’s Land. There were times when we didn’t see a soul. Times when we didn’t know how to reach our next destination because nobody who we asked could tell us. Times when we had to turn our car into a makeshift ferry to cross the mighty Rovuma River over to Tanzania. Times when we could see nothing except pitch black darkness as the moon hadn’t risen yet. Beyond the places visited, I met many interesting people and countless moments will stay with me – many evenings under the stars that triggered philosophical or just obscure thoughts and questions, such as the question of how many stars there are and how many sandcorns there are on earth. During one evening under the stars, we made an earnest attempt to quantify the latter – the figure we calculated is 50,000 quadrillion sandcorns on earth. Be Inspired to travel in Florian’s footsteps! Our very own football fanatic captured his travel experiences during this Africa travel journey through Southern and Eastern Africa in a couple of sample itinerary ideas, most of which are off-the-beaten-path and can be customized further.